Once inside the body, the first cells that will deal with pathogens are macrophages. These cells are just like soldiers that checks all cells continuously in the body. Once an intruder is identified, it will phagocytise and destroy the microbe. These are long lived cells. Some macrophages strategically placed at critical locations like the lining of blood and lymphatic capillaries in bone marrow, spleen, lymph nodes and liver. These fixed macrophages just like ‘checkposts’ will not allow the intruder to enter critical locations in the body. The wandering or non-fixed macrophages are roaming in the connective tissues throughout the body. 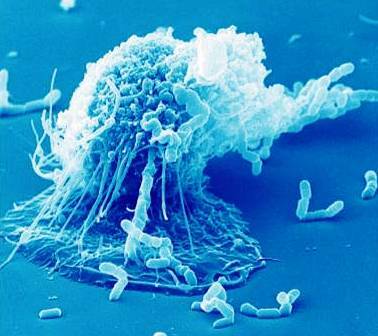 They are first ones to reach a site of infection like leucocytes and kills the microbes. These wandering macrophages are called histiocytes. Fixed and wandering macrophages together form the reticuloendothelial system or RES. 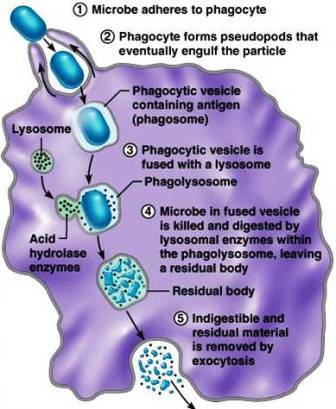 a) Phagocytosis: Macrophages internalize and digest bacteria, virus and other foreignparticles. They can interact with Fc portion of immunoglobulins with their Fc surface receptors, thereby enhancing the uptake of opsonized organisms. b) As antigen presenting cells (APCs): Degraded foreign materials or fragments of antigens are displayed on the macrophage cell surface in association with class II MHC molecule. Degradation of antigen stops, when degraded fragments associate with class II MHC molecule in the cytoplasm. This complex is transported to the cell surface by transporter proteins. c) Cytokine production: Macrophages produces several cytokines. Major ones are IL-1, which is responsible for activating helper T cells and Tumor necrosis factor(TNF) an important inflammatory mediator.